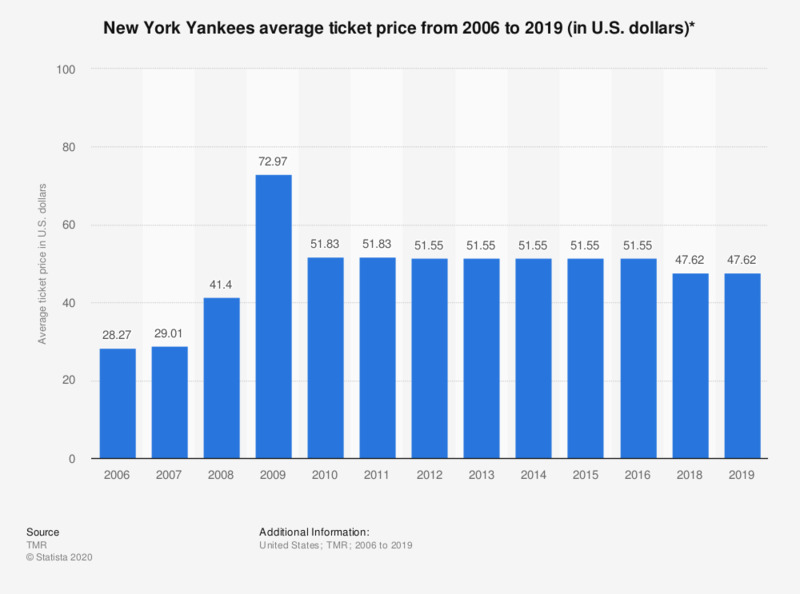 This graph depicts the average ticket price for New York Yankees games in Major League Baseball from 2006 to 2018. In 2018, the average ticket price was at 47.62 U.S. dollars. * The average ticket price represents a weighted average of season ticket prices for general seating categories. This is determined by factoring the full season ticket cost for each category as a percentage of the total number of seats in each venue. This takes into account variable pricing. Premium seating (tickets that come with at least one added amenity or is classified by the team as premium) are not included in the survey to calculate the average ticket price. Average Premium Ticket prices are listed separately. Luxury suites are also excluded. Season ticket pricing is used for any team that offers some or all tickets at lower prices for customers who buy season seats. When a seat category is not offered as a season ticket, we use the weighted average. The data for the years preceding 2011 is taken from the 2011 U.S. Professional Sports Market & Franchise Value Report on page 9. No data was available for 2017.